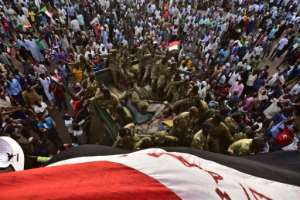 Activists warned of an attempt to disperse a 10-day-old mass protest outside army headquarters Monday, as Sudan's new military rulers came under rising pressure to hand power to a civilian government. "Until we see tangible results, we are not moving from here," said protester Abdulhadi Hajj Ahmed, as crowds remained camped outside the complex in Khartoum. 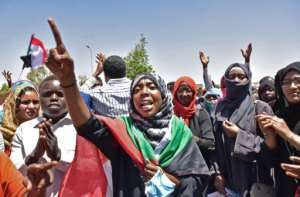 Thousands of demonstrators have kept up their sit-in despite the ouster last week of veteran president Omar al-Bashir, continuing their push for civilian rule after protest leaders issued demands to the new military council. 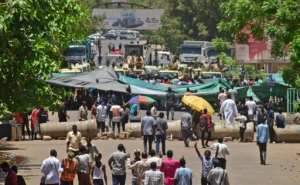 The organisation that spearheaded the months of protests leading to Bashir's fall, the Sudanese Professionals Association, warned Monday of "an attempt to disperse the sit-in". "We call on our people to come immediately to the sit-in area to protect our revolution," the SPA said in a statement, without saying who was responsible. "I felt frustrated when they tried to break the sit-in, but I still trust the army because it's not possible that they would give up on protesters," said demonstrator Mohamed al-Fatih. Portraits of people killed in the months of rallies covered the facades of several buildings in the area. Protester Rasha, who gave only her first name, said she trusted the junior army officers but not the senior ones. "I'm afraid they might make another attempt to break the sit-in," she told AFP. Britain's ambassador to Khartoum, Irfan Siddiq, met the new military council's deputy Monday and stated his "top request was no violence and no attempt to forcibly break the sit in". In the meeting with Mohammad Hamdan Daglo, widely known as Himeidti, Siddiq wrote on Twitter that he also backed the SPA's call for a civilian administration. But at the protest site Monday, witnesses saw a banner with a photograph of Himeidti which read: "We will not forget that you stood with us." The diplomatic talks came a day after the embassies of Britain, the United States and Norway issued a joint statement calling for "inclusive dialogue to effect a transition to civilian rule". But in a news conference, the council's spokesman did not respond to the protesters' latest demands.